Since Tesla announced a 4.5 million square foot expansion of its Fremont factory in 2016, over 400 building permits have been filed with a collective valuation of over $51.3 million. Using our National Building Permit Database, we sorted through thousands of permits from multiple sources to track the facility’s expansion over the last two years and explore Tesla’s plan to create an affordable, high-volume car. Tesla Fremont, located at 45500 Fremont Boulevard, occupies a 370-acre site that until 2010 belonged to NUMMI (New United Motor Manufacturing, Inc), an automobile company jointly owned by General Motors and Toyota. Since July 2017, a team of co-operating robots and humans have been briskly building Model 3s to reach CEO Elon Musk’s stated goal of producing 5,000 cars per week by the end of June. Previously, the factory had been dedicated to producing Tesla’s older vehicle models since its June 2012 launch. Since early 2012, more than 1,000 permits have been filed for the Tesla Fremont facility, mostly allocated to new construction, industrial alterations, and fire protection and alarm updates. Since Musk announced ‘Part Deux’ of his Master Plan in July 2016, months before production began on the Model 3, Tesla has filed more than $51.3 million in construction permits for their Fremont factory. 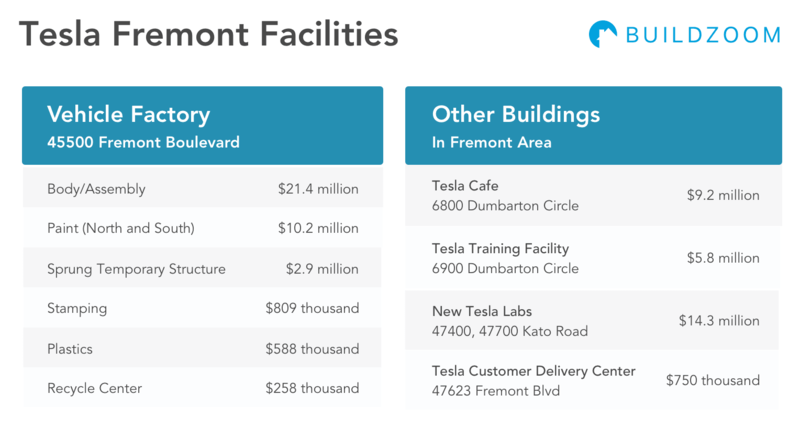 Tesla has also filed more than $30 million in permits for nearby Fremont facilities, including $9 million for a cafe at 6800 Dumbarton Circle, $6 million for a Tesla training facility at 6900 Dumbarton Circle, and $14 million for labs at their Kato Road facilities. In differentiating Tesla’s Model 3 production from other manufacturers, Musk has touted his commitment to a highly automated and lean production process, leading to numerous expensive and lengthy construction projects. The aforementioned permit valuations are all in addition to the $42 million spent on the NUMMI factory (for a joint purchase with Toyota in 2010), the $17 million initially spent on manufacturing equipment, and the $56 million worth of Schuler stamp presses. For Musk, the $200+ million investments have been worthwhile, as he stated that Tesla’s competitive advantage will not necessarily be the car itself, but their hyper-efficient, precise, and scalable factory model. In 2016, Tesla published plans to double their factory footprint by adding 4.6 million square feet across 12 new additions to their Fremont facilities. The additions will expand each of the existing facilities (e.g., Body, Assembly, Plastics, Stamping, and Paint) as well as add entirely new buildings to the campus, all in a stated effort to “remain a key competitive player in the EV auto manufacturing industry” and eventually produce more than 10,000 vehicles per week (a goal stated in their 2018 Q1 report). Although Tesla presented the Master Plans for the factory expansion two years ago, few permits have been filed on the project to date. So far, Tesla has pulled around $7 million in permits for the North Paint Building expansion in early 2015 (a year before publishing their Master Plan), and only a handful of building permits over $100k since July 2016. Larger permits include $1.2 million and $800k permits for site work for two new facilities (one of which is a tent, as discussed below), and a $400k 3-lane “Tesla Sunrise” road with bio-retention system at the eastern boundary of the factory. Musk’s commitment to full automation and rapid expansion has been hindered by production delays, caused by issues ranging from slow battery production to conveyance failures and assembly-line bottlenecks. To make the necessary changes and adaptions to their facilities, Tesla has filed around 100 industrial and commercial alteration permits since July 2016, costing at least $16.2 million and leading to weeks of downtime for production line reconfiguration. According to Musk, however, the biggest constraint on the Model 3 Assembly has been the General Assembly Line (e.g., “GA3”), as discussed below. By exploring the permits filed for each facility within the factory, we were able to break down the cost of building permits as well as commercial and industrial alterations by facility since July 2016. The body and assembly building comprises the largest area in the factory. Since July 2016, Tesla has spent more than $21.4 million on changes and additions to the assembly and body area, excluding the cost of machinery. As Musk stated, General Assembly, located within the body and assembly facility, has been one of the largest challenges to the mass production of the Model 3 car. Since July 2016, permits worth $14.2 million have been filed to develop infrastructure for the “GA3” (General Assembly 3) building. More recently, Tesla addressed this bottleneck by adding an entirely new pop-up facility to house a fourth assembly line. Unlike the other assembly facilities, which Musk said cost hundreds of millions of dollars and require months to build, the new assembly line is housed within a temporary, tent-like pavilion known as a Sprung Structure. Permits filed for the “Sprung” and “repack” tent structures are estimated at only $2.9 million, including the $1.2 million spent on grading and drainage. Though the high-tech robots that comprise Tesla’s Model 3 production line are not always identified within the permit valuations, permits can expose where in the facility the machines are located and how much Tesla spent to integrate the new machinery. One example is Tesla’s Japanese Hokuto Robot System, which is part of the Model 3 body line. To prepare for the machinery, Tesla filed three permits worth nearly $1 million to install eight platforms, connect the robots to a power source, and install the necessary shop equipment and operator booth. The stamping facility located at 45500 Fremont Blvd is one of Tesla’s biggest production innovations. Stamping refers to the metalworking process of pressing flat sheet metal into various body parts for an automobile. Tesla owns one of the only 35 high-end Schuler servo stamping presses worldwide to produce Model 3 parts from rolls of steel, and is the only producer using the servo within the US. Musk has stated that stamping is one of the biggest bottlenecks for the production of the Model 3, and the $56 million machinery investment will help to increase production volumes. According to construction permits, they have spent $809k in updates to the stamping facility, excluding the cost of machinery. The paint shops (North and South) have been some of the more notorious facilities along the production line, having experienced more than four fires over the past four years. The fires, exacerbated by clogged sprinklers and filtration systems, have caused expensive productions delays due to damaged equipment. As the Fremont facility has previously faced investigations and fines from the Occupational Safety and Health Administration (OSHA), investments were necessary to ensure the facility could mitigate and manage future fire risks. Within the paint building, Tesla has spent more than $10.2 million in updates since July 2016. $240k has been spent on fire prevention including sprinkler systems, fire detectors, and other fire detection systems. These permits exclude the cost of the machinery, such as the million dollar paint sprayers that needed replacing after a recent fire. Due to the high occurrence of fires at the 45500 Fremont factory, Tesla has also invested heavily into fire detectors, sprinkler systems, and alarms. Since July 2016, more than 80 permits were filed for fire prevention and alarm systems, for an estimated value of $2.2 million. Elon Musk hasn’t been very secretive about his Master Plan – his strategy has always been to build an affordable, high-volume car using revenue from previous expensive, low-volume models. Yet scaling the manufacturing operation to reach the ambitious goal of 5,000 units per week by the end of June appears to be much more challenging than previously anticipated. Despite investing tens of millions of dollars into the factory’s expansion, reports estimate that weekly production numbers still hover between 3,000 and 4,000 units. If Tesla is to prove the cynics wrong, it may need to continue to expand factory bottlenecks including stamping and general assembly lines, while investing more heavily in safety systems that will mitigate fires and worker injuries. Interested in viewing Tesla’s Building Permits? Contact us at outreach@buildzoom.com for access to the underlying building permit data. Building permits include the estimated costs to exterior and internal structures. Any permits that have not yet been issued do not have permit valuations, and some permits do not include valuations altogether. Construction permits do not include costs for purchasing assembly robots, machinery, or equipment separate from the building structure. Total construction cost estimates for each building were calculated by adding permits that matched specific keywords. 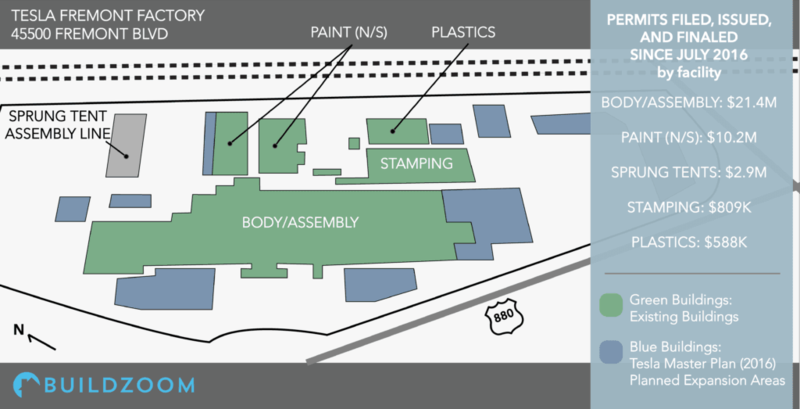 For example, any permit that mentioned “assembly” or “GA3” was assigned to the Body/Assembly building.